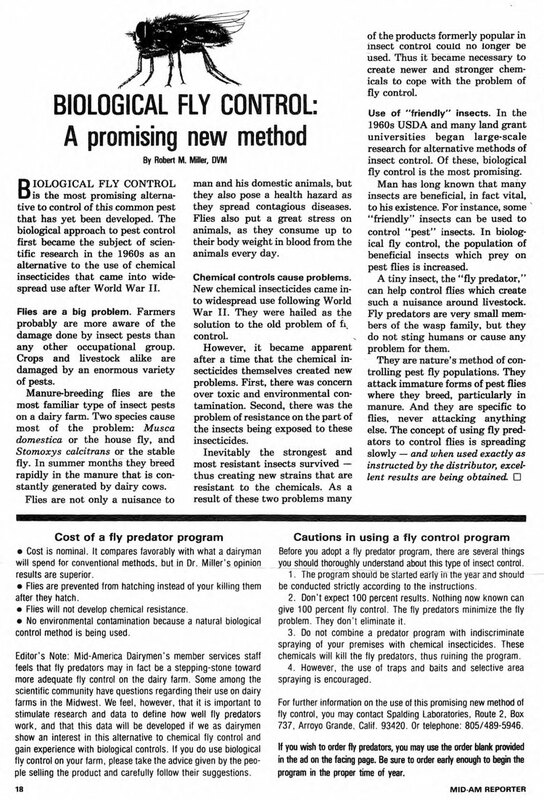 Searching my files for an old article (1961) on veterinary nursing, I came across this 1981 article published in Mid American Dairymen that I thought would interest you. My primary support for Fly Predators is because I am convinced that we are creating resistant flies with over use of chemicals. Just as we have created antibiotic resistant bacteria with our indiscriminate use of antibiotics in both humans and animals. I hope I am wrong but I fear worldwide epidemics of antibiotic resistant bacterial diseases in the near future. So I support a natural fly enemy because like the fly and every other living organism, they will adapt to change in their environment and habitat in order survive. It's called evolution. The goal in all life is survival in order to perpetuate the species. Reproduction! The predator adapts to change as the prey does. So they both survive.